Kollam, Jan 12, 2019 : A major environmental concern for Kerala is the vanishing land in Kollam district, which is rich in mineral resources. A comparison of the Litho map of 1955 and the Google map of 2017 shows how gradually the sea has swallowed the land as Alappad panchayat is down from 89.5 square kilometres in 1955 to 7.6 square kilometres, claim locals, NDTV reported. Locals guide this NDTV reporter through areas where old sea walls are invisible as the sea has reportedly made massive advances to the land and on the remains of old roads now, new sea walls can be seen. For over the last 70 days, protesters have been on a relay hunger strike in Alappad demanding an end to sand mining in the panchayat, which falls under the Coastal Regulation Zone (CRZ). Sajeesh, a local resident who has joined the protests, says, "When surveys have shown that minerals are available outside the CRZ zone, why are they not stopping the mining at CRZ zones. Their mining has also reached a wetland, which just borders one of the survey block given to them for mining. We have given a complaint to the village officer in this matter." Nidheesh, a researcher says, "Right behind me you can see a new sea wall is being built, because the old sea wall is now invisible, destroyed under water. The inland mining too has been illegal, deeper than permissible limits." Sand mining in Alappad has a colonial history. Currently two public sector undertakings - India Rare Earths Limited and Kerala Minerals and Metals Ltd have been given the rights to mine in that area. 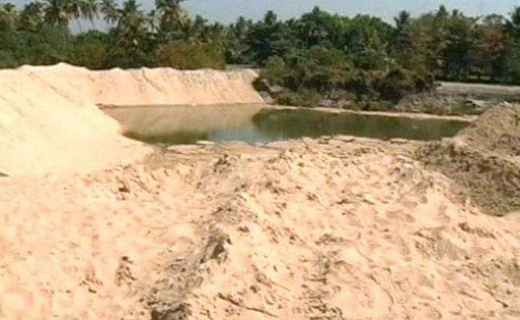 According to the latest report filed by the village officer to the district collector, "Survey shows there has been a loss of 8.49 hectares of land area are under India Rare Earths sand mining. In survey numbers between 82 to 224 - there has been partial loss of land reported. It is understood that the sea is extremely tough in areas under IRE’s mining". The report has been accessed by NDTV. Sources within Indian Rear Earths Ltd told NDTV, "We are a responsible Public Sector Undertaking which has a long history of working in National interest. We mine areas and re-fill them. In some areas re-filling is still in process. We are not in a position to establish the reason for loss of land, it could be even severe coastal erosion, something the area is really prone to." The local CPI MLA has written to Chief Minister Pinarayi Vijayan and Industries minister EP Jayarajan, blaming illegal mining practices and seeking government’s intervention. "There is an urgent need to conduct a study. There can be several reasons like mining, Ockhi, tsunami, coastal erosion. But the demand for the stopping of all mining is not practical", R Ramachandran, CPI MLA, from Karunagapally told NDTV. Ironically, the alarming loss of land has never been investigated, to establish the cause. No independent study has been ordered in this regard, by the state. "I doubt whether these protests have begun by locals themselves. I have been informed unofficially that there are vested interests and rackets operating behind these protests. I need to investigate that. I will be visiting that area", EP Jayarajan, Industries Minister told NDTV. The chief minister has called a high-level meet on the issue on January 16.